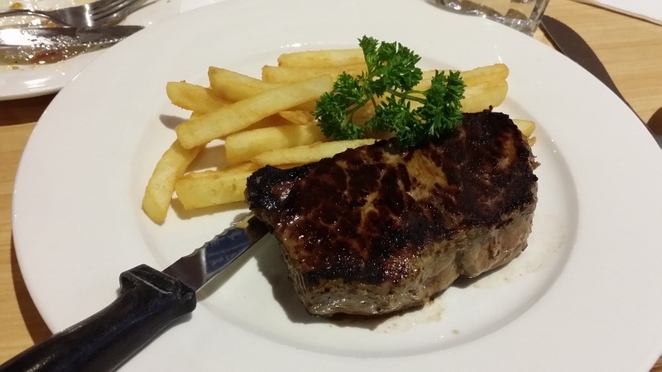 Located in Prospect, the Empire Hotel is a great place to enjoy pub food, some of which is a bit different from what is normally offered at similar places. Each main meal grants you access to their salad and soup bar, where you can help yourself to the salad, soups, sauces and hot vegetable dishes provided. One of the unique dishes that can be ordered, the Lemon Pepper Chicken was cooked perfectly with just the right degree of lemon pepper flavour. A drizzling of hollandaise sauce helped to balance out the chicken with its creamy flavour and there was also a lemon wedge that could be squeezed over the chicken to add more sharpness. Served with the chicken were fries fried to golden brown with fluffy interiors. A staple of most pubs, the portion of Chicken Schnitzel at Empire Hotel was generous. The chicken had a golden brown, crisp coating wrapped around the meat. Accompanying it were fries done as well as the one that came with the Lemon Pepper Chicken. You get to select your choice of gravy, pepper, mushroom or Diane sauce from the salad and soup bar. The pepper sauce we chose for it had a delectable peppery taste and was warm enough to make it enjoyable to eat. We decided to try the rump and porterhouse steaks as there was a steak deal on Tuesdays, when some steak items were offered for the fairly low price of $14.90. Both steaks were cooked to the doneness we liked. We thought the porterhouse was a bit fatty compared to the rump. We chose mushroom and Diane sauce as the accompanying sauces, both of which were great partners to the steaks. Aside from Steak Tuesdays, the Empire Hotel also offers other specials on weekdays such as Seafood Thursdays and Kebab Mondays, when the "star" dish costs $14.90. The ambience of the restaurant was very good with easy parking at the back of the hotel.